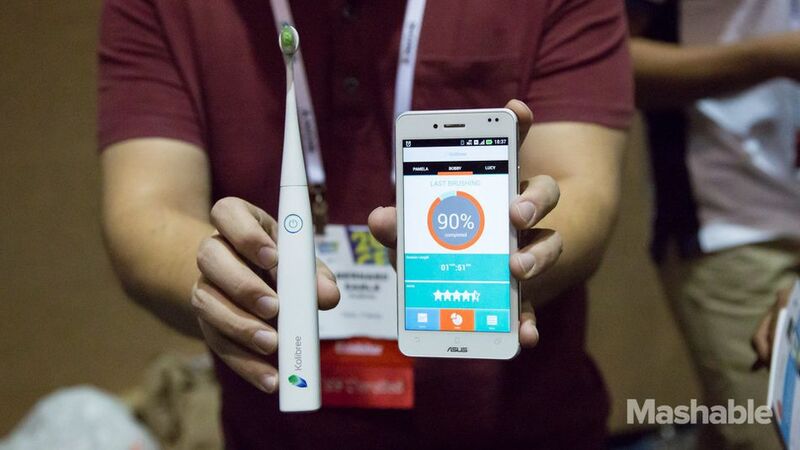 World's First Connected Toothbrush Will Keep Cavities Away - Something New Everyday! LAS VEGAS — You'll have no excuse but be gingivitis free at your next dentist appointment, thanks to the world's first connected toothbrush that keeps daily tabs on your brushing habits. Called the Kolibree smart toothbrush, the device was announced on Sunday at the 2014 International CES show in Las Vegas. The toothbrush, which will ship later this year, provides details about your brushing habits, improving your overall dental health. Price will range between $100-$200, depending on the model (details about different versions aren't yet available). After downloading the accompanying app and connecting it to the toothbrush via Bluetooth, each brush stroke is recorded. The data then syncs to the app and reveals if you brushed long enough and reached important parts of the teeth and gums. The app can works with several toothbrushes, so a whole family can participate. It also rewards improvement and gives a score to help encourage both adults and kids to improve. "It's like a FitBit for your teeth," a company spokesperson told Mashable. "The more you know about the health, the smarter you can be about how to approach it. The same should apply to dental care and oral care hasn't been updated in years." The Kolibree brush will also have an API to let third-party developers create new apps for it.